Note: Amount of fragrance cannot exceed IFRA guidelines (listed for each fragrance on this website) and should not exceed this product's “Maximum Fragrance Load”. If your lotion does not remain white when you rub it into your skin then you have used too much color. If product significantly thins you have used too much fragrance. COMMENTS: It goes on really smooth and lasts al day...plus my customers love it as well, that's the important part. COMMENTS: WOWEE! This has GOT to be my favorite base of them all (and I think I've tried pretty much every lotion base here, either by my own purchases, or gifts from fellow crafter friends)! I'm so thankful WSP offered this base on sale last week, otherwise I don't think I would've tried it (I REALLY like the "Goat's Milk & Honey" lotion base too), but now I will absolutely continue to come back for more! Even at full price, it is worth every penny & then some!! It's a beautifully rich, creamy, thick base that applies so silky-smooth to the skin, hydrates & moisturizes like nobody's business, but absorbs into the skin effortlessly, with no filmy or greasy residue! I LOVE IT! It accepts fragrance & color fabulously too! I never realized this before, but WSP's "Black Amber & Lavender" FO smells so gorgeously similar to Lush brand's "Twilight"/"Sleepy" scent, which just so happens to be one of my all-time favorite lotions. I used this base with that FO (and WSP's Vanilla Color Stabilizer for lotions & washes), and now I never need to buy that lotion ever again- I can make my own! I honestly couldn't be more thrilled with this base! It's AMAZING!!! I like it even better than the lotion I make from scratch! "One of the best base"
COMMENTS: I have tried several bases on this site, but this one right here is the best so far, no matter what I do to it, the texture never changes, smooth and creamy!! "By far the best lotion, ever!" COMMENTS: We use this to make my daughter cream for her eczema. It is the best and shes been able to keep her eczema at bay this winter, which for us is a miracle. I've had others try our creams and they agree! COMMENTS: Customers love that this base is paraben free! Feels amazing on the skin and incorporates fragrance and color easily. COMMENTS: Love, Love, Love this lotion....I ordered a gallon of this and have fallen in love with it. It's silky, smooth, non greasy and my customers absolutely LOVE this new addition to my collection. I just add essential and or fragrance oils, mix and package. Please sort ever stop making this or change a single thing about this. "Shea Butter & Aloe - so creamy and non-greasy!" COMMENTS: I have been using this Shea Butter & Aloe lotion for most of this year now, as I had switched from another company who put a lot more ingredients in their lotions. I wanted less ingredients, better quality ingredients, but still wanted a high quality lotion. And I found it!! This lotion is very creamy - works in both jars and squeeze bottles. My customers LOVE this lotion, as it's non-greasy and leaves their skin feeling very soft and moisturized. I do add my fragrance oils to it and it creates the perfect lotion. This is the only lotion I sell and the only one I use on my own skin anymore! "Our favorite hand and body cream"
COMMENTS: Love the rich creamy feel of this lotion. Its thick and I use the jars for it. This is one of only two lotions we make....its the heavier option. Customers order it by 8 oz jars. COMMENTS: Wow, what a great lotion. Feels wonderful right out of the container and absorbs well without leaving a great residue. I scented lightly with lemongrass EO and even my husband likes it. He says it smells “fresh” without being girly. Can’t wait to hear what my not so picky customers think. COMMENTS: Can't say enough about this. Love it's softness, creaminess, silkyness!!! COMMENTS: Super-rich and silky in texture which absorbs nicely as well. I mixed in additional carrier oils to customize it a bit and it poured lovely. I would highly recommend and use again. COMMENTS: I've used this base in jars as wells as squeeze bottle and just love it! Has such an amazing feel when applied to the skin. The fragrances mix very well with it. My customers love it and so do I. COMMENTS: I absolutely love this base, it feels great on the skin, not to heavy and not to thin. Perfect combination. COMMENTS: I've used this base for a couple of years now and my customers buy it again and again. It goes on smooth without a greasy feeling and takes scent and color very well. It is easy to work with but be sure not to overheat it. COMMENTS: Moisture but no sticky. Love it and will continuous purchases. easy to use and mix well with EOs and FOs. COMMENTS: Thick base that is not greasy and takes fragrance well. COMMENTS: I have a lot of customers with sensitive skin and they all said it works well. This is a very good product. "Great Combination of Shea & Aloe"
COMMENTS: I just received a larger order of this base. I love the way it is so soft & moisturizing. It’s so easy to use. Perfect base to use for vendor events. I love this combination of Shea & Aloe. You can’t go wrong with these ingredients. COMMENTS: Good Quality. Love the ingredients. My family can't do without this one. "No smell and great feel "
"Glad i finally bought it"
COMMENTS: This lives up the the description with a powdery after feel and it is one of my new favorites. COMMENTS: Takes fragrance well. Goes on very smooth and absorbs well. COMMENTS: Rich and smooth, not oily. My clients really like it! Even people with sensitive skin, love it! COMMENTS: Getting a head start for summer. Adding this to our lotion line and I just know it will be by a hit!? COMMENTS: I use this base mixed with a different lotion base, and it is amazing! I use that blend as my daily facial moisturizer and so does my daughter. My customers and wholesale clients love it too! It hold fragrance well and feels super great on your skin! COMMENTS: My customers love this lotion. It is silky smooth and not oily! "Love the Shea Butter and Aloe Lotion"
COMMENTS: Wonderful lotion base that fills in the rough spots on my dry hands. Can't wait to try it after gardening this Spring. It's so smooth and silky and not a bit greasy. I'm making samples in a couple fragrances for friends and may add to my soap line. I love it. COMMENTS: This heavy body lotion is wonderful. So creamy and rich but not sticky or too heady is just wonderful. It takes fragrance and EO great. Just wished I would had try it sooner. COMMENTS: I'm testing different bases to add to my product line - I do NOT have the time to develop a product of my own right now and this is just perfect! COMMENTS: This was my first lotion base I have ever purchased and this one is fantastic :) Made some lotions for Christmas gift from it and used some on my hands. They feel so soft and silky. No greasy feel or off scent to the base. Held fragrance great. Will be buying a bigger size and selling to my customers. "Great Value - love this stuff"
COMMENTS: So soft, silky & supple. Definitely ordering more! COMMENTS: I used this for the first time yesterday and fell in LOVE!!! It’s so smooth and feels HEAVENLY! I will be getting more to use very soon. COMMENTS: I use this base to make my whipped body butters. I love how it absorbs quickly and doesn't leave a sticky feel. Works well after the salt scrubs too! COMMENTS: I love this lotion base, so easy to use and my customers love it! COMMENTS: Really love this lotion base. COMMENTS: I love this base and it's my go to base for lotions. Its creamy and easy to work with. Love that it is paraben and mineral oil free!!! COMMENTS: Great product! I found it helpful to heat up before pouring it into bottles. COMMENTS: Great product! Love the feel not sticky. "A Hit with Customers and me!" COMMENTS: This cream is just the right consistency to add additional botanicals and fragrance without making it overly thin. Dries really quickly on skin and leaves a silky soft feel (not sticky or heavy at all). I use this for facial lotions as I thin it out a bit with botanicals and hyaluronic acid creating a perfect facial cream. I use this as a nightly lotion on my face and have super soft skin by morning, wonderfully hydrating and healing! COMMENTS: This is a lotion with cream properties and does well for drier, colder environments. More substantial than you expect it to be. No weird scent, good stuff. COMMENTS: I was very unsure about ordering a lotion base, as I typically do just lotion bars, but this one was a great choice! It took fragrance well and was very easy to work with! I love it! COMMENTS: I love love love the feel of this lotion!! I have orders several lotion bases and this by far have become my FAVORITE!!! I will definitely be ordering much more of this. • The feel of it! COMMENTS: Very good quality! It feels great and easy to work with! "Shea Butter & Aloe Lotion"
COMMENTS: I ordered this lotion hoping it would be just what the doctor ordered. Wow! Am I totally impressed. Creamy, rich and best of all it's Paraben free. going to order it again. COMMENTS: Product as described. This lotion is perfect to blend with my essential oils. The lotion absorbs well into the skin leaving it feeling nourished. Its not a massage lotion. It provides very little glide before absorbing. COMMENTS: I love the high moisture retaining capabilities of this product, however I would have loved for it to be softer or more fluid in texture. COMMENTS: This is my base for blends of botanical and essential oils that my customers rave about. I hadn't intended on this product being so much in demand when I added it to my aroma therapy gift sets. But now I am really glad I did! Even the men are now buying for themselves, not just the ladies in their lives. Rich and creamy, a little goes a long way! COMMENTS: Really like this lotion. Moisturizing but not greasy. COMMENTS: Great base, holds fragrance well. I gave my customers samples and they are sending in orders! I will have to order a larger qty next time! "Great lotion base and loved among my customers"
COMMENTS: This lotion base is thick, even after adding fragrance and absorbs quickly. It's also not greasy which many people love. I have now resorted to buying 4 gallons at a time since this is out of stock frequently- just goes to show how many people are ordering it! COMMENTS: We use this base to create a lotion for sell at our retail location. Our customers love the fact that it goes on smooth and is not greasy. COMMENTS: I test everything on myself, then my husband and kids. Everyone gives this base a thumbs up. The texture is creamy enough for a jar; but with a light body can be used in bottle too. It makes you feel like you are doing something wonderful for yourself, as if the lotion was very expensive indulgence. COMMENTS: I ordered 16 oz of this to try and wish I'd gotten more! It's wonderful! It makes my skin feel so good! COMMENTS: Paraben-Free, Mineral Oil Free, Light, Non-Greasy, Fast-Absorbing, Takes Scent & Oils well. Customers LOVE it. COMMENTS: This lotion base is very user friendly. My customers and myself just love this product. After my customers try a sample bottle they come back ten fold for the bigger option. You will not be disappointed in this product. Great Great Lotion. Easy to use, just warm up and mix in your EO and bottle up. COMMENTS: I spoon this lotion in jars, lightly scent & color. Very nice and creamy, not greasy, good moisturizing. COMMENTS: Everyone that tries it loves this lotion! I've had people tell me it is just like very upscale lotions. Works better for me in the Malibu bottles, because it's so thick. • People really like this!! COMMENTS: it goes on with no greasy residue and i enjoyed adding various essential olls depending on my mood. "I adore this lotion base!" COMMENTS: This lotion base is light, non-greasy, and fast absorbing...with absolutely no scent. My fragrances, essential oils, colorants, and other additives blend effortlessly into this base. These properties have made it my #1 choice for my lotion line! "THIS IS THE HEART AND SOUL OF MY PRODUCTT LINE"
COMMENTS: THIS PRODUCT IS EXCELLENT FIRST I HAVE TO SAY THAT IT HAS A VERY CREAMY FINISH CLIENTS LOVE THE WAY IT DOES NOT MAKE THEM FEEL GREASY SOAKS INTO THE SKIN AND THE SKIN STAYS SOFT EVEN AFTER SEVERAL HOURS. COMMENTS: I just made some lotion with this base and it is fantastic! My hands feel so soft just after one use! COMMENTS: I really like this even tho I was hesitant to "buy" a pre-made product, especially one that wasn't 100% natural. The customers really like this too, compared to the "salve" I always offered before. 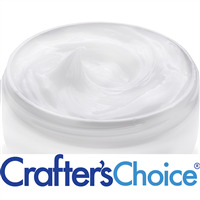 "Crafters Choice™ Shea Butter & Aloe Lotion"
COMMENTS: Love that this is shea butter and aloe, two wonderful ingredients. Mixes well with fragrance, not overly heavy. COMMENTS: After 15 years of cp soap making, my retailers had a lotion spot open up and convinced me to fill it. What to do? Thanks to all who have left reviews, I chose this and the goat milk lotion to scent and bottle. I am not a lotion person, but I will use this, and the feedback from customers (through the retailers) convinces me that this product is here to stay in my product line. Easy to use, silky, not greasy. What's not to love? • The gallon buckets are handy, too! COMMENTS: This base is amazing!!! I switched to this base after using the satin and silk hand cream. Night and day difference… my customers have loved this formula! Very workable, leaves skin soft without being greasy and holds fragrance for a long time. Bonus that is it is Paraben free and Mineral oil free!!!! I've loved it! Thank you WSP for a great base! "My go to lotion base"
COMMENTS: I really like this lotion. I ordered the sample kit and this was my favorite and my daughter took it. It leaves the skin silky not greasy. Can't wait to use different fragrance with this base. "My Favorite of the Bases"
COMMENTS: I really like this lotion. I ordered the sample kit and this was my favorite. I didn't add scent just kept it all for myself. Loved it. COMMENTS: This stuff is so easy to use and too add your own flair to. I LOVE it and PLEASE keep it. COMMENTS: This lotion sells great in the fall in our gift shop! People love the silky feeling it leaves! COMMENTS: This is the best lotion base and my customers love this. I add Botanical Extract One, a fragrance and lightly color and now use only jars as lotion is more like body cream than lotion. "a great lotion base leave skin silky smooth "
COMMENTS: A great lotion base leave skin silky smooth. Scents added are long last. Perfect for dry skin. No residue build up. COMMENTS: Thick and rich, great lotion. I hope to see a 100% natural option as well.. COMMENTS: This makes for a great, light and smooth lotion without leaving your skin feeling greasy. COMMENTS: I first purchased this base with the satin & silk base and, although I really liked both, I thought I liked the Satin & Silk a bit better. Well, now after working with both bases for some time now, I'm thinking that this one is the winner. They both feel amazing on the skin but I find this base easier to work with. It's just a fantastic quality base. My customers continuously comment on how moisturizing it is yet how soft and non-greasy it leaves their skin. I have to agree. COMMENTS: This is a great summer lotion. Light and silky and does not leave your skin feeling greasy. Takes fragrance well and lasts. COMMENTS: I have been making lotions for several years but purchased this before the holiday season because I didn't have the time to make a big batch and needed to have lotions available. My customers love this as much as my own. The dry down is quick and holds up between a couple of hand washings without needing frequent reapplications. Having this available really helped me out and I will always keep some in stock. COMMENTS: This lotion base is luxurious!! Feels fantastic on the skin! My customers love it!! Holds color and fragrance well. COMMENTS: This is tried and true. Everyone that at least tests our lotions fall in love with the fact that it doesn't leave a greasy feeling, but leaves their skin extremely soft. COMMENTS: I was told not to get married to one product if you're not creating from scratch, but I've fallen head over heels for this base and I'm married to it. This base holds fragrance vey well. It goes on smooth and silky and leaves your skin looking amazing. I have very dry skin and I wanted a product that could pass the night test. If after putting lotion on at night and waking up with no ashy skin it's a winner. I tested small batches 16oz to 0.05 I also 0.02 vanilla stabilizer. "LOTION BASE SHEA BUTTER AND ALOE"
COMMENTS: I REALLY ENJOY THIS LOTION BASE IT REALLY MAKES YOUR SKIN FEEL LIKE VELVET. EVERYONE I GAVE IT TOO LOVED IT AND IT REALLY PENETRATES INTO YOUR SKIN EVEN MY SON LOVED IT GOOD JOB. COMMENTS: This is a great base lotion. It's light and is very easy to use. COMMENTS: A pretty good lotion base. Great alternative for vegans. I prefer the goat milk and honey base, though. COMMENTS: What a fabulously cost effective way to test out all of the ready-made lotion and body butter bases! Found some keepers! Thank you, WSP for offering such a great set at an awesome price point! COMMENTS: Love this lotion. Very smooth and nice and thick. Will continue to keep this in stock. I do notice I need to add about a TBS of scent per 16oz. of lotion. Unscented lotion does have a strong scent in my opinion. COMMENTS: This is the best lotion that I have ever used myself and all my customers love this lotion. I make my own lotion, but this is just as skin softening and moisturizing as mine. I have used this lotion since I have been in business and will continue to use this lotion until I decide to sell or give up my business. Thank you Wholesale Supply Plus for such a great product! COMMENTS: This is a very nice product and my customers like it, very thick and creamy. I personalize it by adding mango butter and rice bran oil. I like a bit of a greasy feel. Holds most scents pretty well. Will buy again. COMMENTS: We have been using this base for a year, after trying the others. Love the formula. Leaves the skin soft and non-greasy. A huge hit at the office. • Quickly absorbed with no sticky residue. COMMENTS: I love this lotion base! It is a wonderful creamy quality that absorbs into your skin nicely! Takes fragrance beautifully! "Shea butter and Aloe lotion base"
COMMENTS: This base feels good to the skin, absorbs well and leaves your skin very smooth. It held fragrance well also. COMMENTS: My customers absolutely LOVE this lotion! I have a very wide age range of customers and they all enjoy the way it feels on their skin after it dries. I have a farmer's market booth during the spring and summer and just this past weekend I sold a gallon's worth of lotion in 2oz bottle form. Definitely keep this on my regular supply order list for each week. COMMENTS: This I use in all my lotions. COMMENTS: This is a must have in my product line up! This lotion is thick and creamy...goes on smooth and moisturizes all day. My customers love, love, love this lotion. Goes on easily, non-greasy, holds color and fragrance well. It's also para been and mineral oil free which is a plus to this already great product. COMMENTS: I only got a small container but I liked what I got, it had a good consistency and mixed well with my FO, have not tried it with EO but don't anticipate any problems. I mixed it with Island Nectar FO and White Glitter and called it "Princess Tears" little girls love it! I also appreciate that it is Mineral Oil and Paraben Free!!!! • make it All Natural? COMMENTS: My customers and I love this product! It just soaks right in and repairs dry, cracked skin. This lotion base is easy to work with and well received by people with the popularity of shea butter. "Tried a lot - sticking with this one!" COMMENTS: I have tried a lot of lotion bases and companies and sent a lot of money looking for the right one(s). This one is a keeper, I love it and so do the customers. It feels really great, not oily and sticky - looking forward to see how it performs in the warmer seasons. Will try adding something more to create a little longer lasting feel, but overall this is great and will become my go-to base from now on. Holds fragrance well. COMMENTS: This lotion is nice and thick as is. I added Vitamin E oil and some essential oils to a batch. It did not thin out too much. It feels great as a hand lotion. I have gotten compliments on the texture. "Lotion Shea Butter and Aloe"
COMMENTS: The body lotion is easy to put into containers. The Shea Butter and Aloe make a wonderful moisturizing lotion that melts into your body and does not feel greasy. A very good product. COMMENTS: This lotion base is amazing. Keeps hands soft and silky! My favorite thing to advertise is that it is mineral and paraben free! Great job! Please dont ever get rid of this lotion base! Everyone loves it! COMMENTS: I'm right with my customers on this product....we love it! It blends right into your skin with no greasy feeling. You definitely notice an improvement in your skin. Also WE love the fact that it is mineral oil and paraben free. This has been a tough winter and the demand is high for this cream and lotion. COMMENTS: I love this product as it has no parabens in it. It feels good on your skin. I will repurchase. COMMENTS: I am a 1st time user to lotions, creams, balms etc. I needed something to go with my hemp body wash line so I decided on hemp hand cream. I picked this one because of other peoples reviews. I dumped the bucket of cream in my Presto Cooker. Set the temp on a low setting. Once it liquefied I added my hemp oil and pour into my jars. I let it set over night and then capped them. I don't have any customer reviews yet to throw in here, but I can tell you this lotion is very easy to work with, took my hemp oil well and solidified beautifully. COMMENTS: This is an awesome product! Its super thick and makes a very high end product. My customers love it! COMMENTS: My customers love this lotion. I find the quality excellent. I mix a little in with a basic lotion base, fragrance it and wala!! Love it! COMMENTS: I am in the process of getting ready for my next show and this is going to be a best seller, I just KNOW it. I'm in love with the texture and how amazing it makes your skin feel. Does not thin out with fragrance, or not any that I have used so far. This is being added on to my product line. COMMENTS: All my friends, coworkers and customers love the way this lotion feels. Everyone basically says the same thing...that it feels "silky". Please don't ever get rid of this. COMMENTS: This Shea Butter and Aloe lotion is my biggest seller. People try it and buy the 8 oz bottle every time! COMMENTS: I love this lotion....so moisturizing and nice and thick. A little goes a very long way! Paraben free and mineral oil free---huge selling point for me. It took fragrance very well and my customers LOVE it. Highly recommend this lotion!! COMMENTS: This is such a nice lotion base. Not at all sticky or greasy! I love that it is paraben and mineral oil free, which are great selling points! "Really a very nice lotion base"
COMMENTS: I'm impressed with this lotion base. It feels great, not sticky or grainy. This is every bit as nice as anything you'd buy at the big bath and body shops.
" Best Seller for Me!" COMMENTS: This is a very thick, non greasy body butter. A huge seller for our company! It fragrances very well and retains coloring nicely. Love this product and as long as it remains available, it will be on my list of "must haves" for a long time. COMMENTS: This is a staple of my product line. Please carry it forever!!! Product carries oils well. Not greasy and hydrates the skin very well. My customers love this product! COMMENTS: I have a customer whose daughter has extremely sensitive and dry skin, and this base dos wonders for her! She has tried nearly everything, and this one takes the cake! It is prefect for dry skin, so creamy with a rich emollient nature! Love it! "Positively Perfect In Every Way!" COMMENTS: I absolutely love this lotion cream. It is thick enough so that I lot is not needed, but it does not feel heavy on the skin. I have been using Aveeno's lotion for years, and this FAR surpases it in quality and value. COMMENTS: Great low cost lotion base, works great straight out of can. Takes fragrance & color well and reasonably priced. COMMENTS: This lotion is a great base, I have been using this base for a long time. I get repeat business and my customers like the feel of the lotion. COMMENTS: This lotion goes on the skin and absorbs quickly without leaving any residue on the skin. It has just enough Shea butter in it to provide soothing comfort to children and adults. It is a bright white color and requires minimal color to make it a beautiful pastel. The lotion itself does not have any odor and takes fragrance oil and essentials oils well. The base did not thin after fragrance was added at 2 percent. After adding fragrance the base was still thick enough to place in jars. This is my personal choice for myself when using lotion. I have used a variety of scents without any problems. This lotion also provides a excellent lotion for individuals that can not tolerate scents. At a variety of events this has been a best seller for me. COMMENTS: Selling like mad! Will keep buying it. COMMENTS: Thank you for providing this product paraben free which customers request. Within seconds after applied feels like baby powder. I am proud to have this product in my line. Please aways keep. I love this company. COMMENTS: This lotion is wonderful. All my customers rave about it. I have eczema and this really soothes my hands. Perfect texture and lasts through hand washing. Many customers comment that a little goes a long way. This will stay in my line as a main product!! COMMENTS: Thanks for providing an awesome Paraben free lotion. It is thicker than the Goat Milk and Honey Lotion so plan to put it in a jar or a pump bottle. COMMENTS: I switched to this lotion from the Goat Milk and Honey. My customers never said a word and when I asked them if they noticed a difference they said not at all.